Using Office 365 Exchange Online for your email while leaving the hosting with your existing hosting provider is not as straightforward as one might expect. I want to use Office 365 Online because of its higher storage limit, to manage tasks integrated with my Windows Phone (see: Synchronize Windows Phone with Outlook Emails, Contacts, Calendar and Tasks) – the Mango beta is supposed to include a Tasks app – and to move away from Gmail (because I do not like them scanning my e-mail). I want to stay with my current hosting provider internet24.debecause they have worked flawlessly for years and I want my emails in redundantly in at least two locations as a precaution for service outages. Remember: the 99.9% availability guaranteed by Office 365 allows for ~8h/year downtime. Simply connecting from Office 365 to my existing email server via IMAP is not an option, because I do frequently exceed the storage limit of my current e-mail hosting provider which causes the server to delete old emails – which sadly results in those messages being deleted on the client too(!). With Office 365 you can not simply configure a reply-to address (like you can in Gmail). My e-mail domain is petermeinl.de. My Office 365 domain is leanwork.onmicrosoft.com. By default Office 365 uses pit@leanwork.onmicrosoft.com as send address for my emails and recipients will reply to this address. I wanted to change the send address to pit@petermeinl.de. Verify email domain petermeinl.de in Office 365 using “Admin, Domains, Add a domain”. Cancel the wizard after verifying the domain and before moving it (don’t click Next)! Install Microsoft Online Services Module for Windows PowerShell. 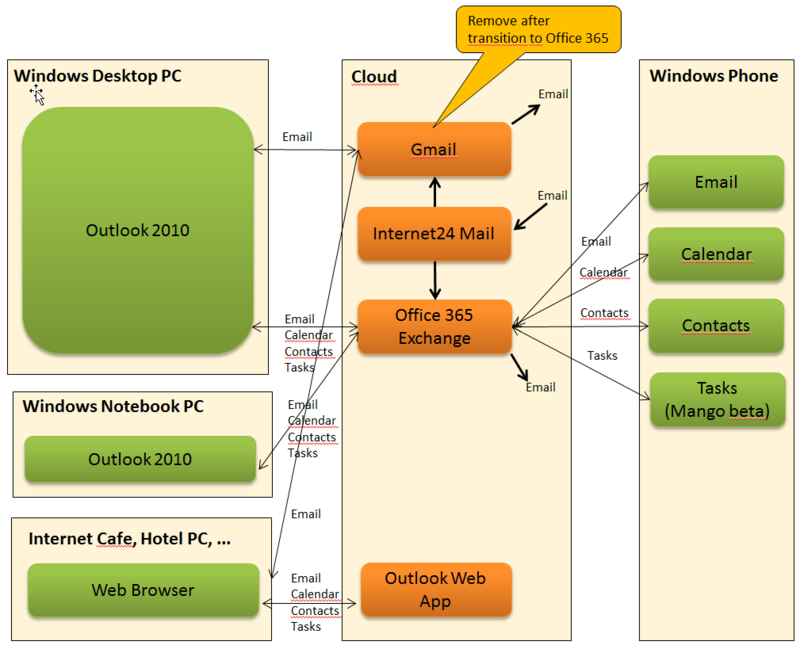 Copied all existing emails from Gmail to Office 365 via the Exchange email migration tool for IMAP mailboxes. Configured email forwarding from internet24.de to Office 365 via the internet24.de admin site. This entry was posted in Computers and Internet and tagged .NET, Email, Office_365. Bookmark the permalink. Argh, I clicked on the “NEXT” button after verifying and it moved my domain! (I was looking for a “MOVE” button to avoid). Anyway to roll back or cancel the move? I don’t know how to rollback, probably you have to do that from your previous hosting provider. Better ask in the forum. I updated the warning in my post. At what step did you get the error? – When verifying your domain with Office 365? – Or when using PowerShell to change the send address? My appologies I realised where I was going wrong, I did not do the full added to the TXT as I am trying to add an e-mail that I do not have any control over the domain(@gmail.com , @rogers.ca, ect.). However I really appreciate your prompt responce. I got this all set up and was happy but I ended up with a problem, once I set this up I cannot send e-mails to anyone else in the domain. When i verify B.com on my 365 it goes fine I can send e-mail from my @A.com and it shows up as @B.com but when i try to send to other @b.com’s I get bounce backs. If i send from any other account like g-mail or gmx it works fine but if i try to send VIA 365 it bounces. Maybe we somehow have to add MX or TXT records to Office 365 similar to what we did at our current provider. More I do not know about this, as I am by no means an expert on email config. 1) Go to Manage Exchange (Exchange Control Panel) (Manage my organization from OWA). 2) Flip to the Mail Control then, click on Domains & Protection. 3) Change the domain type from hosted to shared. I’am trying this the whole day and everytime I receive the same error. I followd exactly the steps as above. @Patrick. Did you add the domain to office 365. I did that too before realizing you have to add the domain, and verify that is it no porting or anything just get it to say verify. After a night good sleeping I tried it again. After following the same steps again everything went OK. The problem was that the Domain verification was not OK yesterday. Problem with the hosting company. Thanx for the manual and the advice. What if I don’t own the domain? This is the scenario: I have a life long forwarding address from my school which I want to keep and I can forward the emails sent to that address to be forwarded to my office 365. Now, I want the office365 to use the same email address (blahblah@ucsomething.edu) as the default sending address. I can’t get the domain registered since I don’t manage the domain. I know it should be a way since my current exchange service provider is doing that for me at double the price and half the size of Office365! Thanks. It really WORKS for me. Sorry for the, daft, question but will the above work if I just substitute my own email address for the ones you show (everything else stays the same)? I should work. Make shure you follow all 3 steps described. If you run into problems check the Office 365 forums. 2. If you try to email to a friend with the SAME domain and that address is not in Office 365 the message will bounce back as Office 365 only looks to her own table. So yes it will change the from address but currently with limitations. We have Blackberry’s in our company and currently forward our emails from our hosting provider to a blackberry email. The Blackberry email is configured to has a reply address our normal email address and this is working. We want to achieve the same with Office 365 that we forward the emails to the office 365 address and that as we reply our own domain is used. This currently is the case however even with the mentioned work around we have to move our email domain else I can never email to my friends or collegues using the same domain. Yes, I stumbled across the same problem and still use Gmail most of the time. You will also need to change the SPF records for (e.g.) petermeinl.de so that email from Exchange 365 passes the SPF test, by adding `include:spf.protection.outlook.com` before the -all. Testing sending email to a gmail account at the moment, I get an SPF fail, but I am waiting for the DNS cache to update so hopefully this will sort itself out. There exists a cloud service named ChooseFrom 365 that allows you to send as any address instantly.